In a previous post, I explained problems encountered with a quantum dot (Qdot)-conjugated secondary antibody. Since then, I have received a replacement Qdot-conjugated secondary antibody (Q22085: Donkey anti-Mouse IgG (H+L) Secondary Antibody, Qdot 625 conjugate) and have had success with labelling tubulin of HeLa cells with Qdots, Hurrah! This is clear from microscope images, where tubulin has been dual-labelled with both an organic dye (Alexa Fluor 488) and the Qdot-conjugated secondary antibody (Figure 1). My name is Ellie Madders and I am in my third year at the University of Liverpool studying Genetics. I am undertaking my Honours project supervised by Dr Raphael Levy. The aim of my project is to deliver gold nanoparticles into the cytosol and demonstrate the targeting of organelles. To investigate this the nanoparticles will be conjugated with various peptides and several delivery methods will be evaluated. First the techniques to deliver GNPs will be assessed. The chosen delivery methods are scrape-loading in which the culture medium is replaced with GNPs and the cells scraped with a rubber policeman to introduce the GNPs into the cell (McNeil, P. et.al. 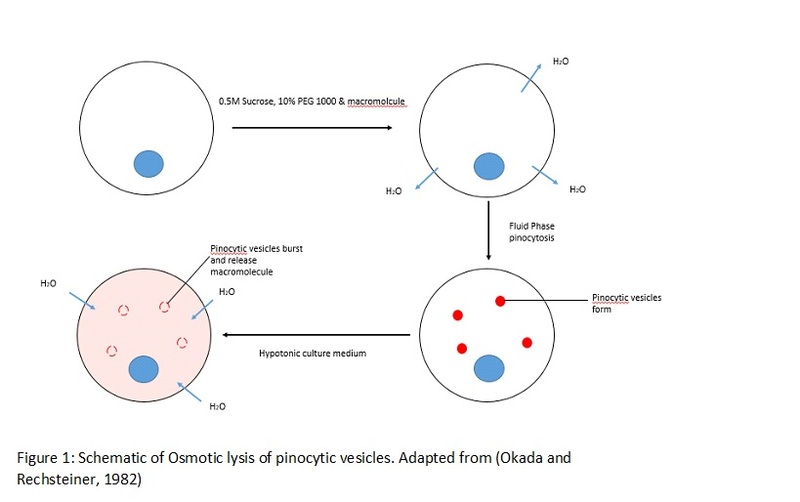 1984) and osmotic lysis of pinocytic vesicles (Figure 1). Once a superior method has been evaluated I will aim to target GNPs to the nucleus by conjugation to the TAT peptide, peptide sequence; WGRRVRRRIRRPPPPPPPPPP (Field et al., 2015). Further organelles that could be targeted could include localisation to the Endoplasmic reticulum via conjugation to the CALNNR8 peptide (Sun et al., 2008). Field, L. D., Delehanty, J. B., Chen, Y. and Medintz, I. L. 2015. Peptides for specifically targeting nanoparticles to cellular organelles: Quo vadis ? Accounts of Chemical Research, 48 (5), 1380-1390. McNeil, P. L., Murphy, R. F., Lanni, F. and Taylor, D. L. 1984. A Method for Incorporating Macromolecules into Adherent Cells,(4),1556. Okada, C. Y. and Rechsteiner, M. 1982. Introduction of macromolecules into cultured mammalian cells by osmotic lysis of pinocytic vesicles. Cell, 29 (1), 33-41. Sun, L. L., Liu, D. J. and Wang, Z. X. 2008. Functional gold nanoparticle-peptide complexes as cell-targeting agents. Langmuir, 24 (18), 10293-10297.